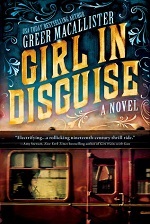 Macallister’s lively new book Girl in Disguise, loosely based on the career of the first female Pinkerton agent Kate Warne, will please fans of historical fiction. She has crafted an enjoyable narrative of an interesting career by teasing intrigue and suspense out of limited information . In her concluding author’s note, Macallister explains what the record shows, and where her imagination filled in the gaps. Unfortunately, she relates, the Great Chicago Fire wiped out most of the Pinkerton National Detective Agency’s files prior to 1871 – a period encompassing Warne’s entire career – so precious little remains about this pioneer. Some facts about Warne are known, however, and it is within this framework that McAllister fleshes out a portrait of what must have been a fascinating, resourceful woman. Most young widows of the 1850s did not make a living by donning disguises to catch embezzlers, thwart presidential assassins, and catch confederate spies, but that is just what Warne did. Answering a newspaper advertisement she convinces Allan Pinkerton that a woman would be a great asset to his team of detectives and spies, as she could go places and gain confidences the men could not. Rather than covering a single case, Girl in Disguise reads like a series of vignettes. Each chapter illustrates a stop on Warne’s journey from neophyte to capable professional – from her training, to rookie mistakes and early failures, and on to her later successes. Macallister’s Warne must hold her own and pave the way for women in the profession. After seeing the truth in her argument for female operatives, Pinkerton had Warne hire, train, and oversee her own department of female agents. A quick enjoyable read for armchair historians and armchair spies. An advance galley of this book was provided by the publisher in exchange for an honest opinion. This entry was posted on March 30, 2017, in Book Review and tagged historical fiction. Bookmark the permalink.